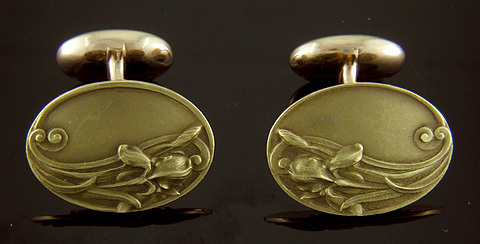 Art Nouveau iris cufflinks, circa 1900. Beautiful Art Nouveau cufflinks featuring richly detailed irises. A nice example of the flowing, intertwining designs favored in the years around 1900. Note how the leaves of the irises flow around the edge of the cufflinks to create the border and accenting scrolls. Crafted in 14kt gold by Krementz and Company, circa 1900.